Arthur Joseph BEVERIDGE M.B. B.Ch., B.A.O., N.U.T. Arthur, and his identical twin brother James (Jim) O'Shaughnessy Beveridge, RAMC, were matriculated, in 1910, into UCD Medical School (Cecilia Street) and did their clinical training at St Vincent�s Hospital. They both joined the Royal College of Surgeons Officer Training Corps. 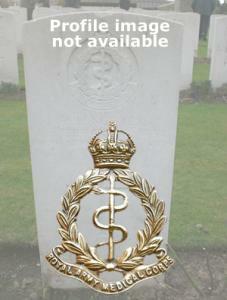 Arthur gained a commission of Lieutenant in the Medical Services (Special Reserve) on the 27th July 1914. He mobilized on the 19th July 1915 and entered the war in France on the 5th June 1916. He was promoted to Captain on the 19th January 1916. Arthur�s brother Jim died from wounds on the 22nd November 1917, and the chaplain who was with Jim when he died did not have far to go to break the news to his twin. Arthur had had a premonition that something dreadful was about to happen. He was so grief-stricken that he could not carry on at the front, and was given three months� compassionate leave. He returned to Dublin and spent six weeks shut up alone in his room, speaking to no-one. Arthur returned to the war, he was awarded the Military Cross "For conspicuous gallantry and devotion to duty. His dressing station was heavily shelled during an engagement, but owing to his determination, courage and initiative, a large number of wounded were attended to and evacuated from the danger zone." He served as acting Major between 4th January 1918 and 15th February 1919, and received the General Service Medal and clasp for his service in Iraq during 1919 - 1920. Arthur continued to serve with the Medical Services until he retired on the 21st March 1958. 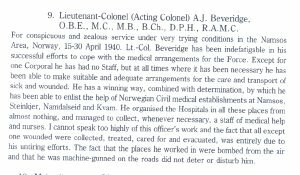 During this time he served with many different medical units in various parts of the world, and was awarded the OBE, the Norwegian Military Cross with laurels, and was further mentioned in despatches twice.